Millennials who love to travel, please take note of the newest hotel to come to Washington, D.C.'s National Harbor: AC Hotel by Marriott. Set to open in April 2015, the European-influenced lifestyle boutique hotel is geared toward younger generations who seek free Wi-Fi, quiet spaces to telecommute and extraordinary dining experiences. Previously known as Aloft Hotel, the site has undergone a multi-month renovation of its 192 rooms. 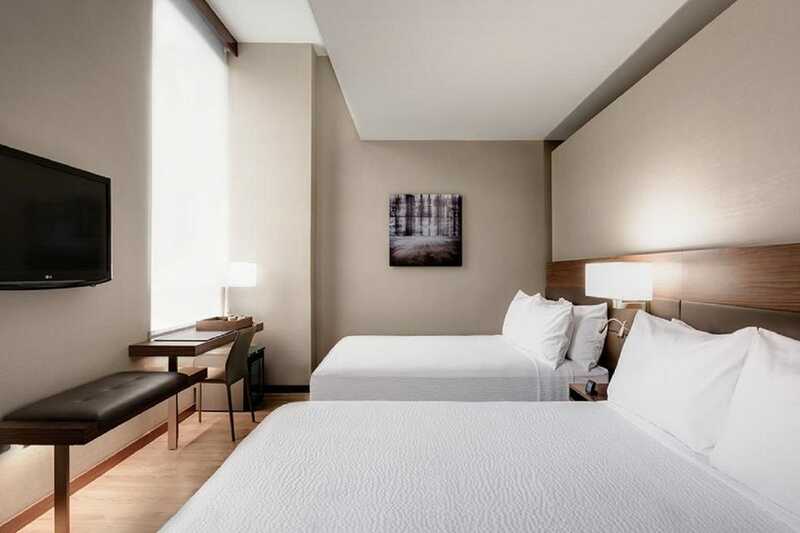 With a neutral color palette, each room has simple yet modern décor, with sleek and sophisticated furnishings for travelers to enjoy and relax in. By each bed, you'll find multiple outlets; feel free to charge your phone while looking at it as you doze into dreamland. Only some rooms offer views of the Potomac River, so make sure to chose that option upon booking. One aspect that will get many excited is the AC Lounge, which features craft beers, on-tap wines, handcrafted cocktails and an array of small tapas-style food choices. The bartenders know where the best spots in the area are. So if you're unfamiliar with the nation's capital, be sure to ask them for tips. Early-risers can check out the AC Kitchen, which offers a number of breakfast treats, including tempting tarts, freshly baked croissants and an array of artisan cured meats and cheeses. The eight-story building also features the AC Library, a simple yet modern area designed to be a haven for those who need a quiet space to plug in or work remotely. Try to grab a comfy chair by the fireplace! Make a note to venture out onto one of the outdoor terraces, which offer a beautiful view of the Potomac River. If you need to keep up your workout routine, don't worry. There's a fitness center on-site as well. AC Hotels by Marriott is quite popular in Europe, with several locations found in Spain, Italy, Portugal and France. The brand didn't make its North American debut until recently, when its first hotel opened in New Orleans in late 2014. This location on the National Harbor is the company's first foray in the Northeast market and its third in the United States. So if you're in town for a business trip, you want to take a spin on the National Capital Wheel or you're just looking to make your wallet lighter with all the shopping options, then be sure to check out the AC Hotel for a modern place to rest your head. New Hotels Open Up This Year in Washington, D.C.
Gina Gallucci-White wishes she could try some of the on-tap wines at AC Lounge.